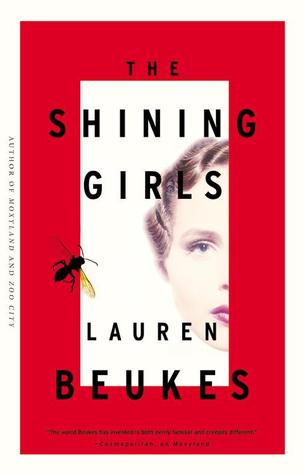 There was a lot of buzz at Book Expo America about Lauren Beukes’s new novel, The Shining Girls, and for good reason. The most often heard synopsis I heard was “Time Traveler’s Wife meets Silence of the Lambs”. If you’re squeamish that may be all you need to know but if you can handle a serial killer who disembowels his victims, Beukes creates a creepy but compelling character in Harper Curtis, a drifter who, in 1931, finds his way to a house in Chicago that when he exits it, takes him to another time. For Harper, this is the door to finding the women he calls the shining girls—young women he meets when they are still children or teens and whom he promises he will come back to see when they are older. They have no way of knowing that this intense, disquieting man will see them when they’re older for the sole purpose of extinguishing their brilliance. He slits his eyes and tilts his face as if he is enjoying the sunshine so that it doesn’t seem he is examining the faces of all the girls who pass him. Glossy hair and bright eyes under heavy make-up and fluffy hairstyles. They wear their privilege like it’s something they pull on with their socks in the morning. It blunts them. It isn’t until 1974 that he meets Kirby, a six-year-old girl who may change his destiny. When he comes back to visit her in 1989, he makes the mistake of leaving her for dead but she survives, horribly wounded and mutilated and begins her life’s work to find him. This entails getting a newspaper job as an intern for the reporter who handled her story and convincing him to help her with her theory about additional Chicago murders by the same man. For Kirby, although she has physically recovered, she has found her old life to be gone and a new one difficult to start. Along the way she misplaced her friends. The old ones didn’t know what to say. Whole relationships fell into the fissures of awkward silence. If the horror show of her injuries didn’t stun them into silence, she could always talk about the complications from the faecal matter that leaked into her intestinal cavity. The Shining Girls is a careful reading book. There are all the girls Harper craves—each with her own chapter, flashing back to their youth when they met and moving forward in another chapter to the year when Harper shows up to claim them. Beukes has done careful historical research and each of these young women imprints her unique personality, her shine, on the reader from a radium painted dancer who glows in the dark to a welder who works in the 1943 shipyards. Additionally, as the novel progresses it becomes less certain as to who (or what) is actually controlling events. Within the house there is a room with a wall covered in Harper’s handwriting and a talisman from each of the girls. It is these items that he leaves from one body to the next that connect them all but is the house directing him or has he created the house? It’s not a question that gets answered but as the plot builds and the fear rises it adds to the unnerving quality of this tangled story. Who will prevail? Back at the House, it seems all of the objects are on fire in his head. He can still trace the trajectories, but for the first time he can see that the map leads nowhere. It folds in on itself. A loop he can’t escape. The only thing left to do is surrender. I just got a copy of this and feel like I absolutely have to read it. I’m dying for a book that I can’t put down (it’s been a while) and I feel like this could be it. Maybe I just need some good creepiness right now! Shannon, it will definitely hold your attention but the time transitions are a bit hard. I had to keep going back and forth. Still, Kirby is a great character and it will fulfill your need for creepiness!